I saw a muskrat on my way home from work today. robertscott wrote: so do Canadians have the highest representation on this forum? There's probably more from Glasgow than Canada. Only one from Glasgow here mate, KPj's from Kilmarnock which is about an hour away. so the tally as it stands has the US in the lead. Triple Edit: And Stephen and Kenny Crox and Oscar, also all for the US. We could get technical on this and get Ironman to check IPs, that would be interesting to see the stats. I try to avoid web analytics whenever possible. It does seem to be a pretty even mix from English speaking countries. I would think the percentages would be very close between all the English speaking countries, and then a few from other countries skewed more heavily to those that have a lot of people who speak English as a second language, such as Sweden or Germany. robertscott wrote: Only one from Glasgow here mate, KPj's from Kilmarnock which is about an hour away. I can get to Glasgow in 20 mins. There's trains with fewer stops that get here/there quicker (I think). My brother and sister stay in Glasgow, i'm there quite a lot. With a little notice I would be up for it. Although Sundays are my "bodybuilding day" so this day might suit us better. I have a strange thing going on just now. Women keep wanting to train "with" me. Since I made that client a training partner, more women have wanted in on it. Weird. On Saturday and Sunday, we had 4 women, including my sister, lifting with us. Another 2 want to join in now, too. We call it a Pride. A typical lion pride has 2 males and 5 females but it can be a lot more, too (Maybe Matt will know). Sounds ideal. Also, male and female training together works surprisingly well. Women need to slow down and men need to speed up. It balances out nicely. My main training partner and I could easily do heavy singles/doubles/triples for over an hour then call it a day. Always had a bad habbit of missing a lot of the small stuff in work outs. But women are efficient! We now rest less and get more done over all whilst the women actually get stronger, and surprisingly quickly when training with us and other women. I never noticed how much better my conditioning has became until last nights session. After speed bench (8 x 3) and incline BB bench (4 x 8), we had 5 x 10 DB rows and flew through it. Normally this would end me - I think 5 x 10 of DB rows is probably some of the most brutal "conditioning" you can do if you go heavy enough and keep rest short. I even managed to hit up tri's (rolling DB Extensions) and some bi's (poundstone curls!) afterwards, all in 60 mins, and still walked out feeling like I had more in the tank. I work til 5 on a Sunday, so it'd have to be evening. Most of the gyms I can think of that do day passes around where I live charge quite a bit. Virgin is [1 million dollars]! Crazy stuff. Good gym though, it's got everything you could want (plus about a million things you wouldn't, including wi fi café). Obviously now you've leaned out you're the sexiest damn trainer in Kilmarnock and the honeys have come flocking. Although I seem to remember last time we talked about women you said you were on a gay sabbatical. How's that working out for you? Yeah I've noticed Megan rests for much less time than I do on the rare occasion we train together. I put it down to my conditioning being terrible; I haven't trained with enough women to tell really. One thing though I have noticed with Megan, and I think Bret Contreras (might've been someone else) said something to the same effect, is that she can get more reps at a higher % of her max than I could. For example, she can front squat 37.5k for 5, but stick another 2.5k on and she'll struggle to get 1. Weird. What a day. Watched my sometime training partner tie the knot with his lovely lady. If ever there was a match made in heaven these two are it. Then got a compliment on my deadlift form in the local gym. Nice day! I saw three car accidents on my way home from the gym today. Nasty weather. Does anyone else push the bar up on a heavy squat? When coming out the hole on a heavy squat, I remember I sometimes pulled down on the bar by accident to sort of tighten up and push. I stopped this once I noticed because it's making more work for me. Lately I've changed to pushing the bar when I'm at the hardest point to sort of urge me out of the hole. Psycologically it works too by me thinking I'm helping my quads out. Anyone else do this? It helps me stay tight but I wonder how much difference it actually makes in force. I'm still looking forward to doing my powerlifting comp write up but it's been a real hassle getting all the videos for it. Hopefully i'll have them this week. Technology eh, so many ways to send data but so much hassle to get these videos. Anyway, another girl at the comp put a video up of my now training partner, former client. There's a few pics of her floating around, in the hole of a squat, too because, interestingly, our squats were the deepest. Probably because we were the most nervous! I believe this is her third attempt, 140KG. The scottish record for her class was 115kg. Remember we prepared for a bad day and to get 9/9 lifts. She easily has plenty more in the tank. I love her technique, for a third attempt on the platform. She's one of the clients i'm most proud of and her progress really gave me confidence in what I do. She couldn't deadlift 60KG when I first started training her. She's also lost a significant amount of bodyfat and is aiming to drop down to a lower weight class for August. She'll need to drop about 15-16lbs. The lower class is more competitive with the Scottish record being 155KG which she will smash when the time comes - I think she's got that in her just now. 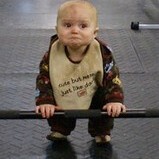 Nevage wrote: Does anyone else push the bar up on a heavy squat? When coming out the hole on a heavy squat, I remember I sometimes pulled down on the bar by accident to sort of tighten up and push. I stopped this once I noticed because it's making more work for me. Lately I've changed to pushing the bar when I'm at the hardest point to sort of urge me out of the hole. Psycologically it works too by me thinking I'm helping my quads out. Anyone else do this? It helps me stay tight but I wonder how much difference it actually makes in force. Yes!!! You should push your upper back into the bar. This fits in line with leading out of the hole with the chest, too. The write up of my comp is also going to include an analysis of my squat. Basically, I spent a lot of time (as in, several months) targeting "sticking points" in my squat - training paused squats and bottom up squats. Getting stronger at them and seeing no improvement in my actual squat. I posted a video on StrengthCoach and got some great feed back (from Brett Jones ). My problem was/is technique. This realisation came a few weeks before my comp so I decided not to change anything so close to it because I knew I could get the Total I was aiming for without getting any stronger - sometimes a technique change will lower your numbers for a little while. Sometimes they increase instantly but that wasn't going to happen in this case. Anyway, one my issues was the hips coming out the hole before the chest. One of the fixes is to drive your back into the bar. Another is to pull yourself into the hole. BTW, I have realised I didn't "lower" myself into a squat, I dropped into it. Losing tension and therefore, power, before I even started driving back up. I also changed my foot position. I thought I pointed my toes out but I was practically toes-forward so I make sure I have the toes out more than I think I should. Will be easier with the videos but I thought it would be helpful, and also to see the fix as the weeks/months go on. robertscott wrote: Although I seem to remember last time we talked about women you said you were on a gay sabbatical. How's that working out for you? haha, I don't think I used those words. I just needed/need a break from women for a while. Too many years in relationships. I've realised it's not for me. I'm going to be like George Clooney and date a string of hollywood beauties, wait till the "honeymoon phase" is over, then break up and move on. Since i've had this attitude, I've been surrounded by them. All of a sudden I have a group of female friends - not, friends with "benefits". Just friends. I've moved into a bachelor pad with my training partner and every couple of nights, one (or all) of the women we train with comes by the house. When we moved in we jokingly said you are always welcome in our house as long as you bring some kind of food. At any moment the door could go and it'll be a female with a couple of trays of chicken wings or similar. Sometimes they even cook for us. It's amazing how women respond when you tell them men are the better cooks. They try really hard to prove you wrong. It's quite strange but i'm not complaining. Sometimes I feel like i'm in a sitcom. robertscott wrote: One thing though I have noticed with Megan, and I think Bret Contreras (might've been someone else) said something to the same effect, is that she can get more reps at a higher % of her max than I could. For example, she can front squat 37.5k for 5, but stick another 2.5k on and she'll struggle to get 1. Weird. I find this, too. I quite like to throw in rep-outs after a heavy set, and we'll all drop the same percentage of weight for it. I like it because it means beginners can compete directly with me. They're also at a slight advantage but, I don't tell them that. And I hate losing. So it makes things nice and competitive and gives the weaker lifters a chance to be on top. Anyway, most of the time, women smash the rep outs. Also, they're fine after what seems like 20 seconds and setting up the next exercise where as I'm still breathing out my a$$ 3 minutes later. KPj wrote: Since i've had this attitude, I've been surrounded by them. All of a sudden I have a group of female friends - not, friends with "benefits". Just friends. I've moved into a bachelor pad with my training partner and every couple of nights, one (or all) of the women we train with comes by the house. When we moved in we jokingly said you are always welcome in our house as long as you bring some kind of food. At any moment the door could go and it'll be a female with a couple of trays of chicken wings or similar. Sometimes they even cook for us. It's amazing how women respond when you tell them men are the better cooks. They try really hard to prove you wrong. I wish I had a harem of women to bring me chicken. I need to get some female training partners. There's very few girls use the weight room at my gym though. Megan loves it because she's the strongest one. KPj wrote: I find this, too. I quite like to throw in rep-outs after a heavy set, and we'll all drop the same percentage of weight for it. I like it because it means beginners can compete directly with me. They're also at a slight advantage but, I don't tell them that. And I hate losing. So it makes things nice and competitive and gives the weaker lifters a chance to be on top. Anyway, most of the time, women smash the rep outs. Also, they're fine after what seems like 20 seconds and setting up the next exercise where as I'm still breathing out my a$$ 3 minutes later.